When your PC seems slow, unstable, or you think it might be infected by malware, then your first step should be to take a very close look at the processes it's currently running. You could turn to the Windows Task Manager, but that provides only very basic information. If you want an in-depth report, something that makes it easy to spot and control unnecessary, resource-hungry or malicious processes, then you'll need to try this. The main window of What's Running is a Task Manager-type display of the processes running on your PC. 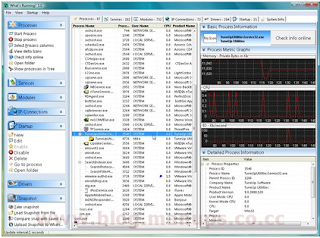 By clicking a process will display a graph showing its recent RAM, CPU usage etc. IF don't know a particular process name then don't worry, there is an option "check online" that compares its name against an online database of common processes.